Technology has helped the human race in many ways, it allows people to contact their families quicker and more efficiently, it helps doctors and many other professions, but could it be the devil in disguise? In some cases technology requires resources that are hard to acquire without harming the environment and many companies use nonrenewable sources, such as metals that are used in hybrid car batteries. When these metals are extracted the Sulfuric acid is released into nearby waterways killing plants and animal life. New farming technology is one of the top concerns for environmentalists. The pesticides and fertilizers that farmers are using to increase production although these advances have led to cheeper and a wider variety of food, is it really worth harming the environment over. Many modern fertilizers stay in the area for up to 6-8 weeks. It damages soil and gets into underground water which can lead to dead zones in lakes and oceans, which are spots where the oxygen is so low that the marine life suffocates. Technotrash is another issue to the environment. 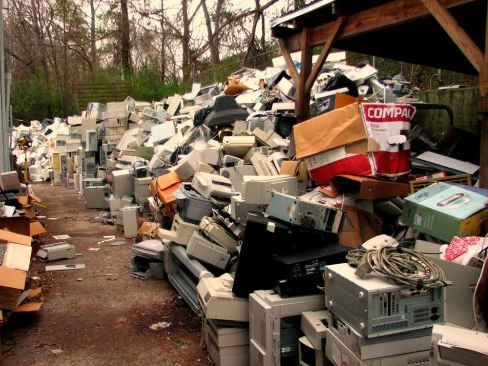 Technotrash is the wast that manufacturers make and old used computers and phones. These products contain non-biodegradable and toxic materials. Over time toxic materials can leak into the ground and harm the water we drink, the plants we eat and the animals that live around the area.